I have two projects to share with you today! The first one is a card by Mary J. Her paper choice is always Pear-fect! :) You can grab the freebies she used HERE. On to next one! An amazing pizza box by Snehal. It's a great idea, isn't it? :) The hearts she used on this project is HERE. Thank you so much for sharing, Mary & Snehal! I look forward to seeing your creations using my digis, everyone! Thx for showing my card Torico - you know I love your creations! 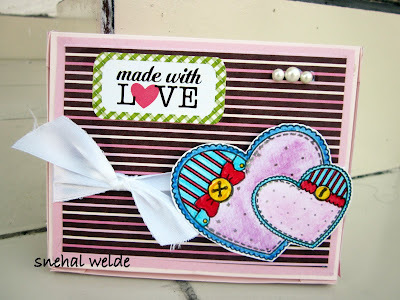 Gorgeous, sweet card by Snehal - what a lovely use of the papers! Thank you for the freebie!! I love your stamps!